At abc: hand made graphic works on aluminum. 21 pieces 50x70x3cm each; road marking paints and mixed oil and water based paints on uncoated aluminium. Documentation: Torben Höke. 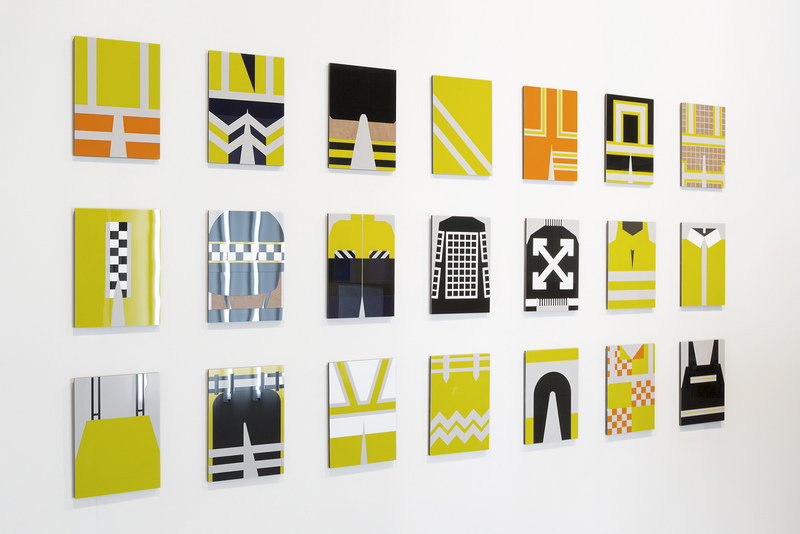 In addition to the booth, Alona exhibited the "Car Huggers", a textile work on two cars (collaboration with BMW Mini) and a lecture on the history of high visibility clothing. Plexiglass edition: 25x35x1cm, plexiglass mounted on MDF, edition of 5. Available via artsy or directly through the galleries. Rodeh’s artistic practice consists of extensive inquiries into cultural systems that merge objects, spaces and situations into carefully choreographed mise-enscènes. Her ongoing meta-project Safe and Sound highlights the growing presence of safety markers in the urban landscape and their diffusion into popular culture. Her growing digital collection of the many high visibility workwear available on the booming market of safety products, encouraged Rodeh to map out their graphic variations, following a process of deduction. At ABC, Rodeh presents a sequence of 21 hand-painted graphic works that trace various work-wear designs, all rendered in the strict format of 50x70x3 cm, and executed on uncoated aluminium sheets. This sequence of works comments on the many variations of graphic visuals which are omnipresent in our daily routine, but become easily avoidable and often overlooked. Beginning in September 2016, Alona Rodeh will start her ZK/U artist residency at the Berliner Feuerwehr (The Berlin Fire Brigade). Accompanying the fire fighters for a period of 6 months, her research will focus on the training facilities and workout regime, the daily routines at the station, and fire control itself. Through this research, Alona Rodeh's aim is to create a new collaborative work within the organization, focusing on new challenging missions, enabling the firefighters to try new techniques stretching their limits of abilities. In the tour, Rodeh will give her input and one of the fire fighters will expose some of the techniques and facilities at the station. growth of “high visibility” aesthetics in entertainment and workwear fashion. Expanding her work to the streets, two cars covered by the artist’s custom made car covers will park at ABC's entrance. Collaboration with BMW MINI.